The most important component of “Si parla, si canta” is the language study. We have seen time and time again that the better you “parla” the better you “canta”. This is why mastering the Italian language and Italian diction is our first priority. Every day, Monday through Friday, begins with 3 hours of Italian language classes, which are offered at all levels for students of all ages, from grammar classes for the absolute beginner to literature courses for the extremely advanced. The programs are therefore flexible, adaptable, varied, rich, and unique. In addition to the 3 hours of Italian grammar class offered every morning, Italian conversation classes take place every Tuesday and Thursday afternoon. At “Si parla, si canta”, participants are truly given every opportunity to perfect their Italian. Shown above: The Comune where the Italian language classes are held. While mornings are focused on the study of the Italian language, afternoons serve as an opportunity to apply all that you have learned in the classroom to music. Participants receive a minimum of 2 private coachings per week with our esteemed faculty as well as numerous scene rehearsals on operatic repertoire previously assigned. “Si parla, si canta” is a program rich with performance opportunities. Within the four-week program, singers can expect to participate in at least three public concerts. In addition, each summer we average close to five public masterclasses. For our scenes concerts, we have the great pleasure of performing in some of the most cherished venues of northern Italy. 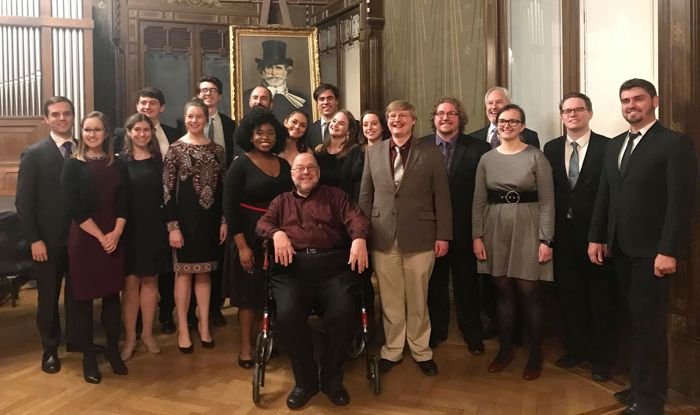 Shown above: Benton Hess with participants of "Si parla, si cantas" Holiday Program after their final concert at the famous Casa di Riposo per Musicisti, founded and funded by Giuseppe Verdi. “Si parla, si canta” does not forget that amidst all of the work and study that goes on during the week, it is still important to find time to enjoy the Italian culture and all that the beautiful Piemonte and Lombardia regions have to offer. There will be some planned excursions, but the beauty of Arona is its location. 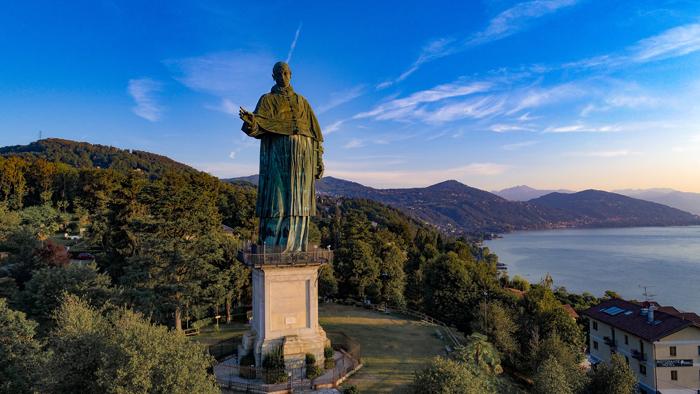 It is right on Italy’s largest lake, Lago Maggiore, and yes, there is a beach. It is almost equidistant between Milano and Switzerland, so if one desired, one could lunch in Switzerland and dine in Milano. Genova and Turino are both easy trips, as are many, many other points of interest in northern Italy. Shown above: The statue of Cardinal Carlo Borromeo. Photo courtesy of Luca Carmella. Click here to read what students said about their experience at "Si parla, si canta."